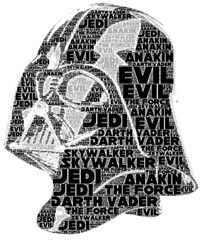 I was putting my son to bed, and I said, "I feel like writing a computer program, but I don't have any ideas," and he said, "make something that draws Star Wars characters with words," and I had most of the code for that kind of thing lying around, and here it is. In the days after the inauguration of #44, I saw many, many blog posts and newspaper stories featuring Wordles of the inaugural address. In my opinion, while they are lovely enough, they don’t really address what makes one person’s words distinctive. To see if I could do any better, I spent a couple of days making Comparisons of Inaugural Addresses.